Oh how I love crochet. Until recently I didn't realise how much this crafty pursuit pleases me. After I get home from work I sit down and chill out with a cup of decaffeinated tea and enjoy spending an hour or so each weekday evening crocheting. I'm so glad to have found a craft that I can do anywhere, whether it is sitting on the sofa, on a car journey, or at the kitchen table, I love how portable and simple it is. The therapeutic and rhythmic motion of crochet is so relaxing especially when you know what you are doing and no longer need to follow a pattern. I love sitting listening to music or a podcast, or watching a film or TV programme whilst having a bit of hooky time. Recently I've found myself spending even more time with a crochet hook and yarn in my hands, it's a perfect crafty escape that once started doesn't need too much concentration after a busy day. It really is one of my favourite things at the moment. 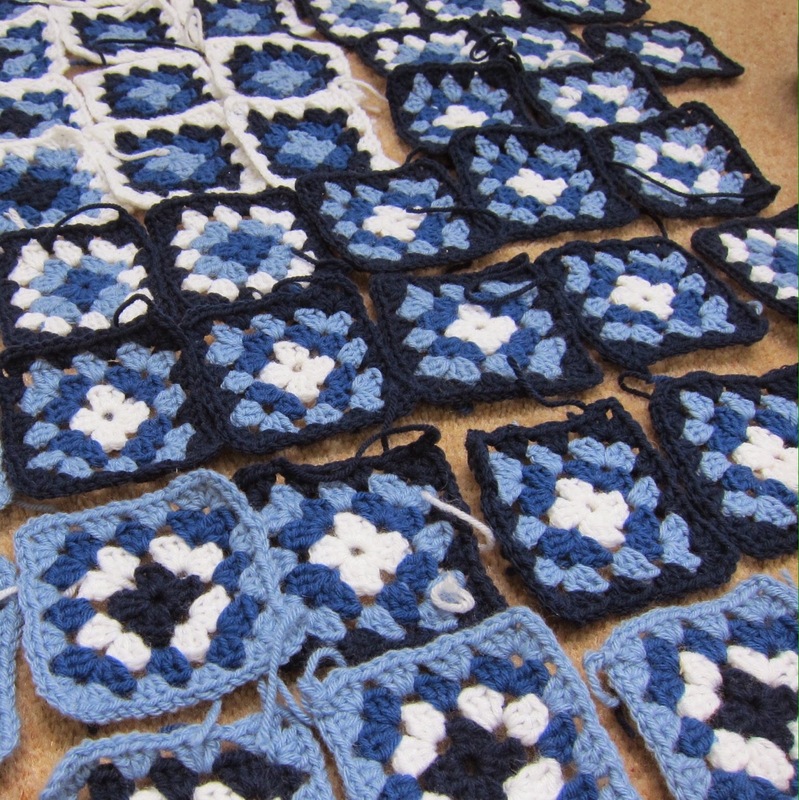 I started dabbling with crochet a few years ago and have slowly been making granny squares for a blue and white blanket. I'm still gradually working on the granny square blanket and love working in rounds creating square by square. 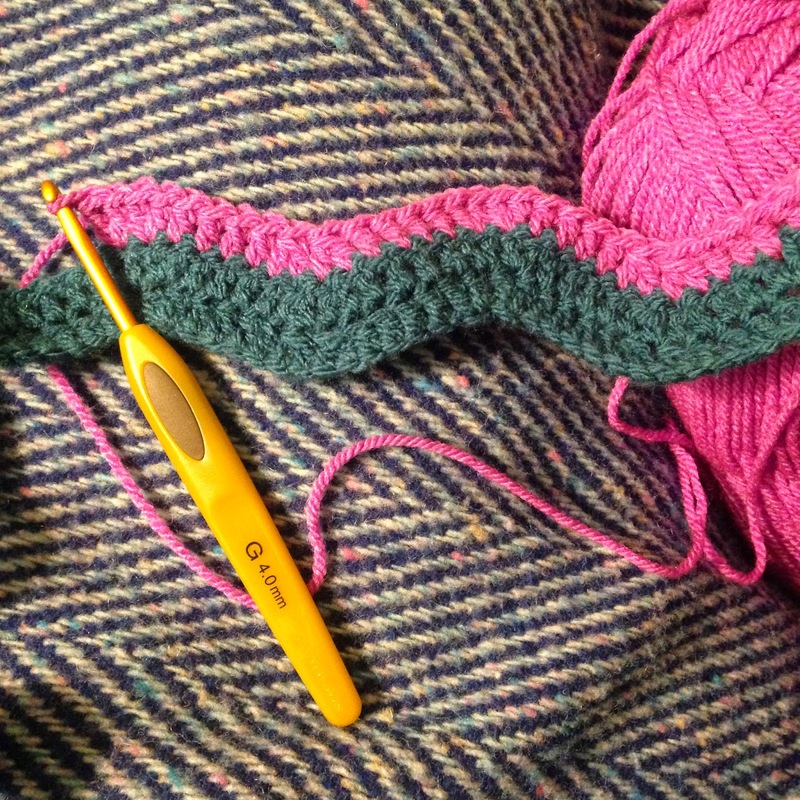 The small steps of this blanket make it a project that is easy to pick up and put down. Over the past few weeks I've been creating granny square after granny square and so far have made 66 granny squares. I decided that what I needed was another project to work on to mix it up a bit. I decided that I would take the plunge and create another blanket, this time with stripes. 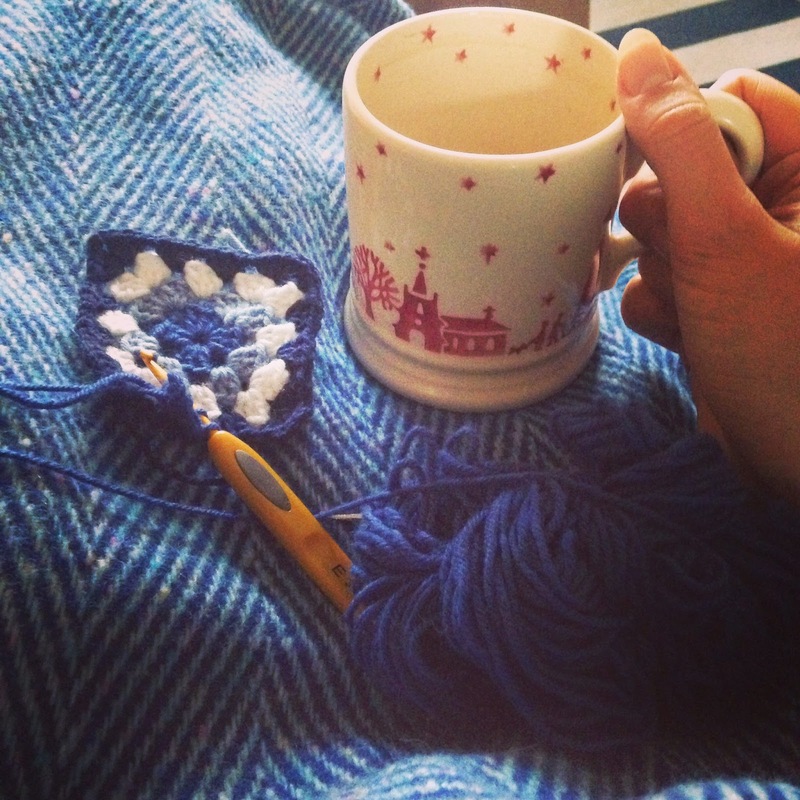 I'm a huge fan of a brilliant crochet blog called Attic24, written by the super inspiring Lucy. Attic24 was one of the first blogs I read and it inspired me to learn crochet. Lucy is a blanket fan and has been lovingly creating many gorgeous blankets over the years. I have been admiring for some time her beautiful neat ripple blankets. Take a look at Coast, Cottage and her first ripple blanket, they are so yummy and I love the colour combinations. I decided to pluck up some courage and have a go myself. Having only made granny squares so far I knew I needed to step out of my comfort zone and try something new. I needed a reminder of the basics of crochet and pulled a few of my trusty crochet books together for reference and took time to read and print out Lucy's Neat Ripple pattern that she has written and is free on her blog. Lucy's excellent step by step explanation enabled me to make a small sample, and from that moment on I was hooked and had made the decision to jump into a new project. This month I bought some yarn in a multipack (check it out here) and topped it up with a few extra balls of wool and have started to make my own ripple blanket. Unlike most of my projects I haven't gone with a specific colour theme, I've decided to make a multi-coloured ripple blanket! I've decided to make it 4 foot by 6 foot, it's a good size to snuggle under but will also look great draped over a chair or put on the end of a bed. I'm using Lucy's Neat Ripple Pattern as the guide for the width (213 foundation chains for a 4 foot wide blanket) and will just add row by row until I get to the length I'm happy with. As with fabrics, I enjoy combining colours and what better way to brighten up the cold and dark winter evenings with a fun, colourful and achievable crochet project. I just love the colours of yarn and can't wait to see how this project turns out. I may add a few more colours into what I have as there are quite a few pinks and purples. I fancy a lighter yellow and maybe another shade of green but I will see how I get on. Yesterday I completed my 6th row and am really enjoying the pace of the project and the sense of achievement. I adore having such a range of colours to choose from, it feels really indulgent, and means I can enjoy selecting a new colour every two rows. The ripple pattern is now firmly in my head and I don't need to check the pattern anymore, it feels like great progress. I love working the decreases and increases in this pattern and feel I've pushed myself a little further forward with learning some of the basics of crochet. This project has a great sense of achievement and I'm really enjoying seeing the project grow row by row. 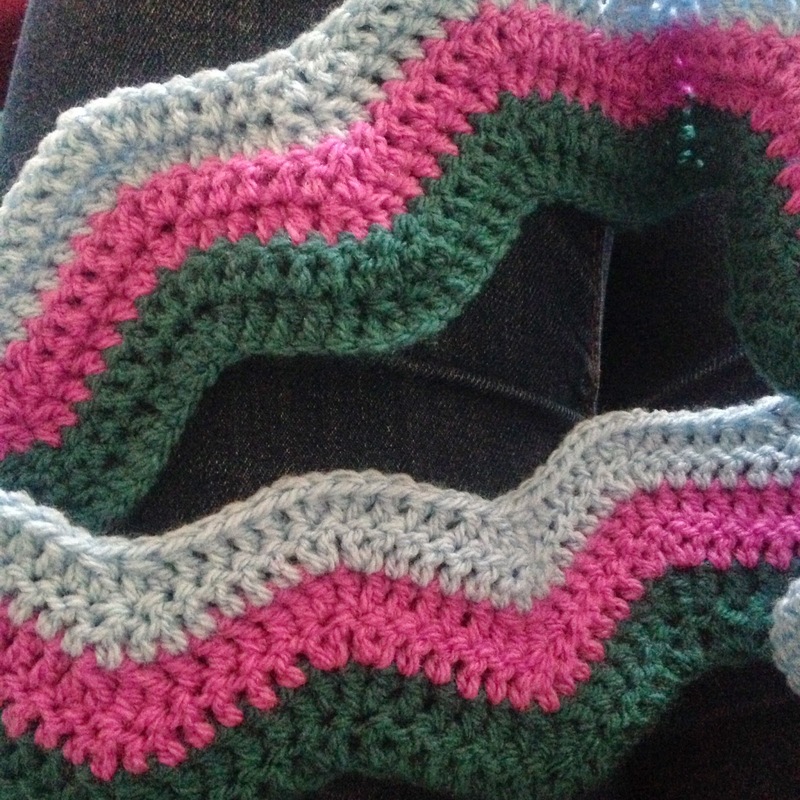 I'll keep you posted with my project updates here and on my Facebook, Twitter and Instagram pages as I gradually create this ripple crochet blanket stripe by stripe. If you have mastered a granny square already and fancy a new simple and relaxing blanket project I would definitely recommend this one.